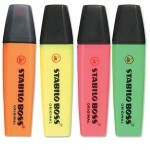 The 4-pen test: A simple, quick and powerful, strategy diagnostic tool. then this 20 minutes strategy diagnostic test will help you. This white paper provides a useful strategy diagnostic test that I run with my clients on their strategy or plans: I call it the 4-pen test or the “Strategy by hope and magic” test. It arose during a strategic balanced scorecard engagement, from the simple exercise of looking through a client’s strategy and trying to identify which statements would fit into each perspective of their strategy map. A first cut that helps you develop the frame of the strategy map and checks how extensively the strategy actually explains what will change and how the strategy will come about. Doing the exercise revealed that there were lots of statements about the results of the strategy, about improvements in performance, cost savings and outcomes for their customers and community that they wanted to happen. However, there were practically no statements about how the strategy would bring these changes about. You can see why I coined the phrase “Strategy by Hope and magic”. 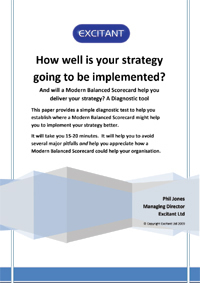 The test is based on the fundamental model within the strategy map and balanced scorecard. This is the balanced scorecard’s cause and effect model that runs across the perspectives and captures the essence of the drivers of strategy and strategic change in organisations. This simple model goes to the heart of strategy: What capabilities do we need to learn and grow as an organisation to be competitive, deliver our services, and do so economically and sustainably? This test is really simple. Download the white paper, find four different coloured highlighters, get out your strategy document and set yourself 20 minutes to work through it. I guarantee that you will either feel smug or horrified by the end. Download “The Four Pen Pest” of your strategy. PS. This Strategy diagnostic will also work in the public sector or a Not for Profit organisation. The instructions for using it in are included in this document. The difference is that you need five pens, not just four.